Starting early, heading west, after a short breakfast stop near Rethymnon and then a drive past Chania, we reach the port of Kissamos. Here we take our boat for a pleasant approximately one hour sail along the coastline. 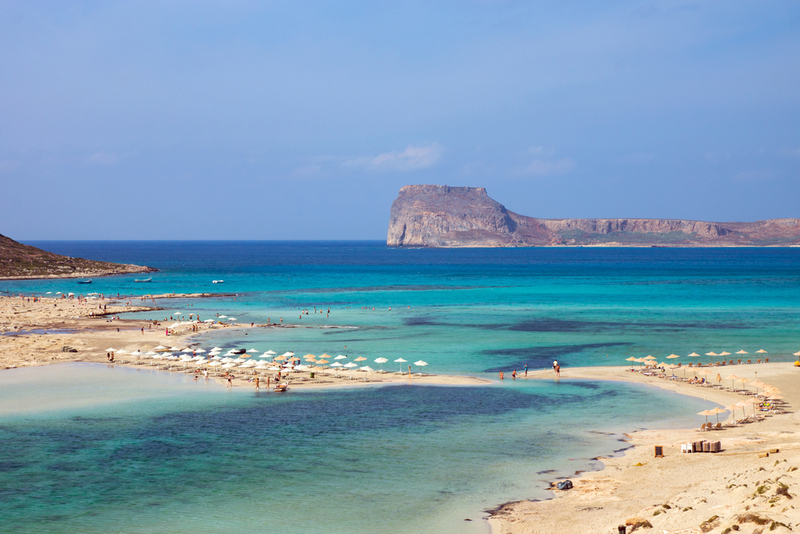 On the way, you can see impressive signs of the geological phenomenon known as land elevation, as Crete has been ‘rising out’ of the sea by 6 to 7 metres on the western side and ‘sinking’ in the sea on the eastern side for more than 2000 years. Arriving in the port of the ex-pirate island of Gramvousa we hear how, during the Turkish occupation, the residents of the island started looting passing boats thus giving the island its pirate reputation. According to Homer, Gramvousa is the island of Aeolus in ‘Odyssey’. It is a protected biotope, and is host to more than 400 plant species and over 100 birds species and is home to the Mediterranean seal Monachus Monachus and the sea turtle Caretta Caretta. Don’t miss out on a visit to the Venetian Castle on the top of a steep rock as this is one of the most impressive castles in Greece. There is plenty of time for swimming or lunch on board. The spectacular view, the marvellous landscape and the “legend of the pirate’s hidden treasure” is an attraction not to be missed. Our boat then departs for the Blue Lagoon of Balos, a shallow and warm water lagoon which brings to mind similar lagoons in the Caribbean. Here the crystal-clear, azure coloured sea water in combination with the white sand makes this place unique. Gramvousa is one of the most beautiful beaches in the whole world. You will find it difficult to believe that such a place exists.! Enjoy a fantastic swim and relax for approximately three hours before boarding for the return sail. An experience to remember for a lifetime!